Healthy mothers can give birth to healthy children who will be the flag bearer of the nation in future. Poverty, lack of proper nutrition, low sanitation, and inadequate medical facilities are responsible for the high infant mortality in India. The central government under Modi has implemented several mother and child welfare schemes. Apart from these programs, state governments also have their own version of similar projects. One such child and mother welfare scheme is active in Tamil Nadu. The name of the scheme is Muthulakshmi Reddy Maternity Benefit Scheme or MRMBS. Modi was not the first person to design a welfare scheme for pregnant mothers. 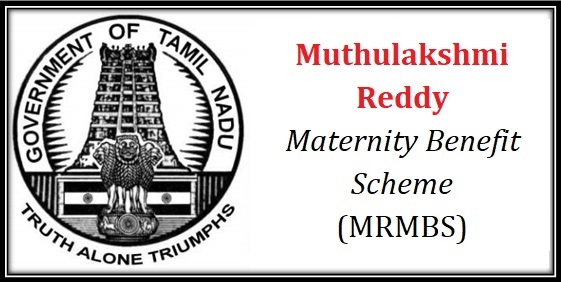 The Muthulakshmi Reddy Maternity Benefit Scheme is not new in Tamil Nadu. The program was implemented in the state for the first time in 1987. The state was under AIADMK rule and the CM was V.R. Nedunchezhiyan. Recently in 2018, under CM Edappadi K Palaniswami, the same scheme has been revised yet again, to offer more relief to pregnant women. The scheme will be monitored by the Integrated Child Development Services Department. Offering better nutrition – The financial support will allow the poor women to attain better medical as well as nutritional facilities. Adequate nutrition is expensive and the monetary aid will enable pregnant mothers to get optimum food. Cash assistance – Earlier, the scheme was offering Rs. 12,000 to the pregnant mothers. With the revision of the scheme, the monetary assistance has been hiked by Rs. 6000. Now, applicants will receive Rs. 18,000. Number of installments – The total financial assistance will be paid by the state authority in 7 separate installments. Nutritional kit – Apart from financial assistance, the program will also ensure better health and nutrition of the pregnant mother and unborn child. Every applicant will get a nutritional kit. This kit will contain health mix, dry dates, iron tonic, protein biscuits, ghee, disinfectants, towel and tablets. PICME portal – For better monitoring and implementation of this scheme, the state government has introduced a new portal[https://picme.tn.gov.in// ]. All interested candidates will have to register on PICME or Pregnant and Infant Cohort Monitoring and Evaluation website. The site generates a code that will store details of each applicant. Number of beneficiaries – As per records, the state has already offered monetary assistance to around 25,698 pregnant women only during the previous two years. It is mandatory for the candidate to reach out to the nearest city or village health care center. Doctors will do necessary tests and confirm the pregnancy. As soon as the confirmation comes, the candidate must take the help of health care specialists and get her registration on Pregnant and Infant Cohort Monitoring and Evaluation. With the completion of the registration, the site will generate a 12 digit code. It is the Reproductive and Child Health ID and is a must to avail the benefits of the scheme. The registration should be done within first 12 weeks of pregnancy. After proper verification, the state authority will dispatch the first installment of Rs. 2000. The second installment is worth of Rs. 2000. But it will not be in form of cash. The state health department has designed a pregnancy nutrition kit. The reports of prenatal checkups and ultra sound must be submitted at the health center to acquire the kit. The third portion will be given to the candidate at the end of forth month. The mother has to undergo several medical tests, to confirm the health of the unborn child as well as the mother. The fourth payment will also be done in the form of a nutritional kit. The kit will contain special nutritional mixes and necessary medication, which will keep both mother and child healthy. The cost of this kit is Rs. 2000. The fourth payment will be done only after the woman gives birth to the child. The amount that every new mother will get, at this stage is Rs. 4000. Candidates will only get this sum for institutional delivery. The sixth part of the payment will be dispatched in the bank account of the woman only after preliminary vaccination of the new born is complete. Each candidate will receive 4000 in the sixth installment. To attain this amount, all documents of child vaccination needs to be submitted at the registered health care center. The final portion of the payment will be done once the child has attained the age of nine months. The payment will be made before the child attains the age of one year. Each mother will get Rs. 2000 in her bank account for the final time. Residential criterion – The first eligibility is associated with the residential status of the pregnant women. As this is a state sponsored scheme, only those candidates will get the financial assistance, which are registered residents of the state. Financial background of the beneficiary – As per the draft of this scheme, only pregnant women who come from a financially weak background will be offered this economic assistance. They must belong to BPL category and must have proper certificates. Aadhar card – According to the recent mandate of the central government, if a person is interested in getting the benefits of any state or central welfare scheme, then he/she must get the Aadhar Code linked. Thus, all pregnant women must have their Aadhar cards as well. Age related criterion – It has been state in the program draft that only those women will be able to get the financial assistance from the state, that are of or above the age of 19 years. Reproductive and Child Health ID is a must – Apart from the above mentioned criteria, all interested expecting women must register online and get their respective Reproductive and Child Health IDs. If any woman does not have it, then she will not receive the cash. Bank account – As the finds will be transferred in the active bank account of the pregnant woman, it is mandatory that each interested candidate has a bank account. A scheme that is as elaborate as this will require a substantial amount of monetary allocation. Keeping the intricacies of this mother and child welfare scheme in mind, the state government of Tamil Nadu is prepared to meet the financial requirements. As of now, a whopping 21.76 crore has been dedicated for the successful implementation of this project.